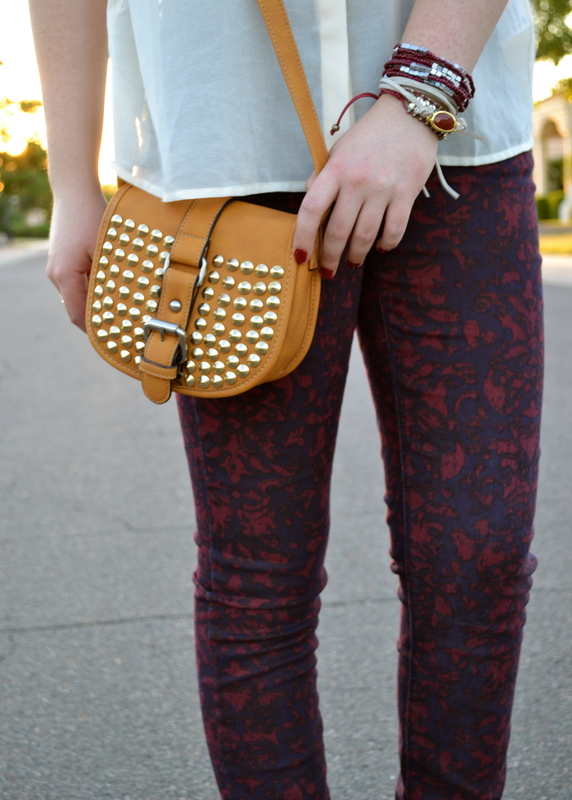 Studs have become a huge trend this season. Fall 2012 is full of edgy flare – from collared shirts and purses, to shoes and more, studs are everywhere. 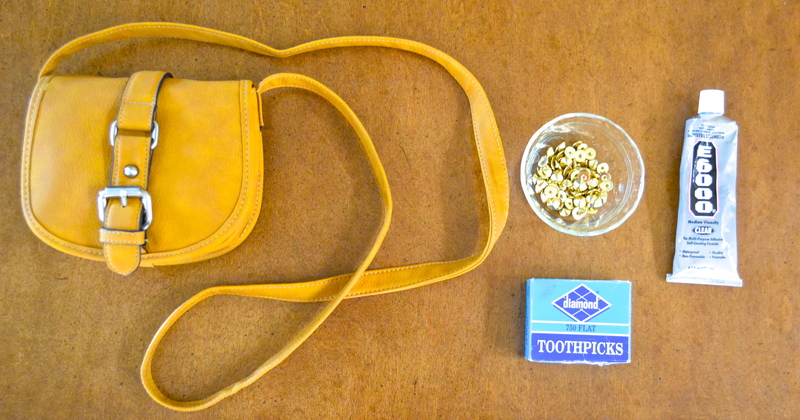 Tiny, cross body bags and this cognac color have been popular on celebrities and bloggers alike. This tutorial combines these three trends to ensure you’ll have the most fashionable accessories around. 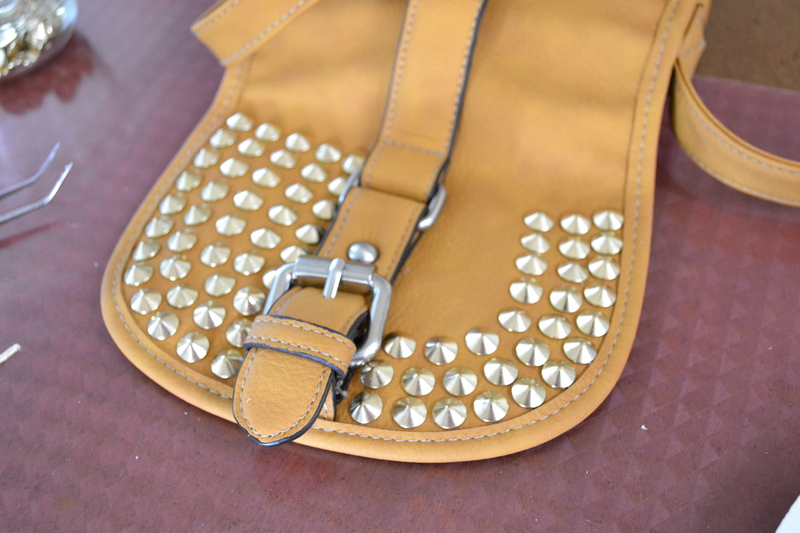 Begin by separating the studs into two piles (42 studs were used on either side of the front flap). It may be helpful to place all 42 studs on the purse without glueing them down so you can fiddle with the pattern and get the spacing how you want it. 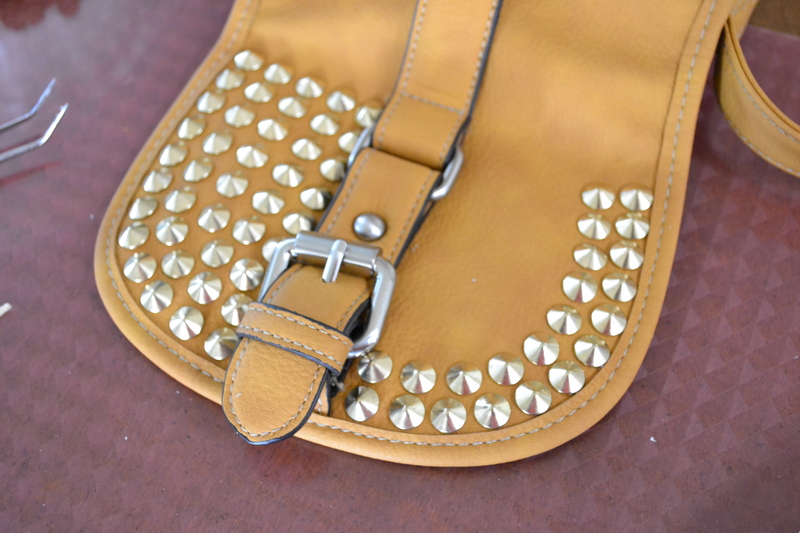 When you are ready to begin gluing the studs in place, position the first row along the outer seam of the purse. Using the tweezers or your hand to hold the stud, apply a small dot of the glue to the back of the stone with a toothpick and gently press it to the fabric. 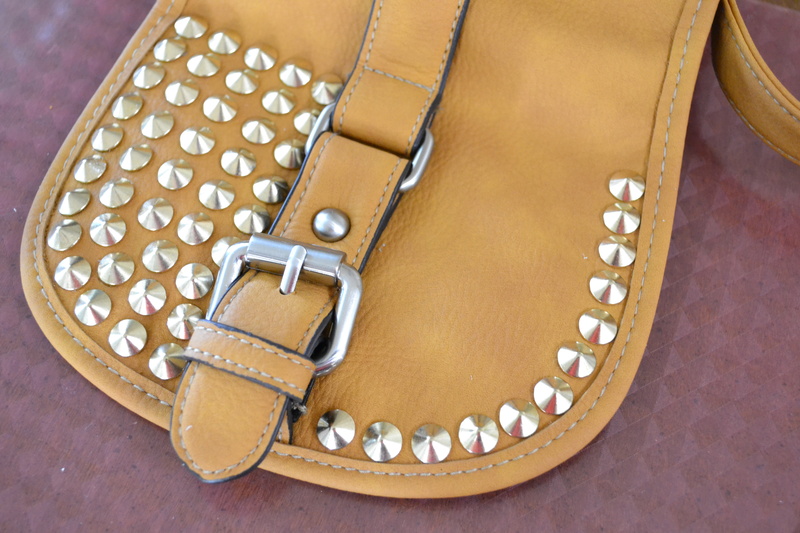 The first row on the first half of the purse will consist of 12 studs. 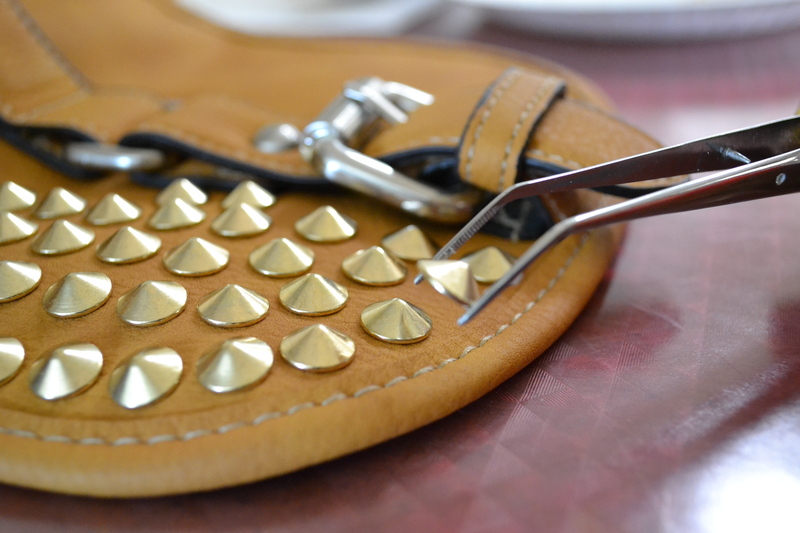 *Press and hold the stud for a few seconds to ensure the glue holds to the surface of the purse. Place and glue the next row of 10 studs next to the first row, following the half-U shape of the bag. 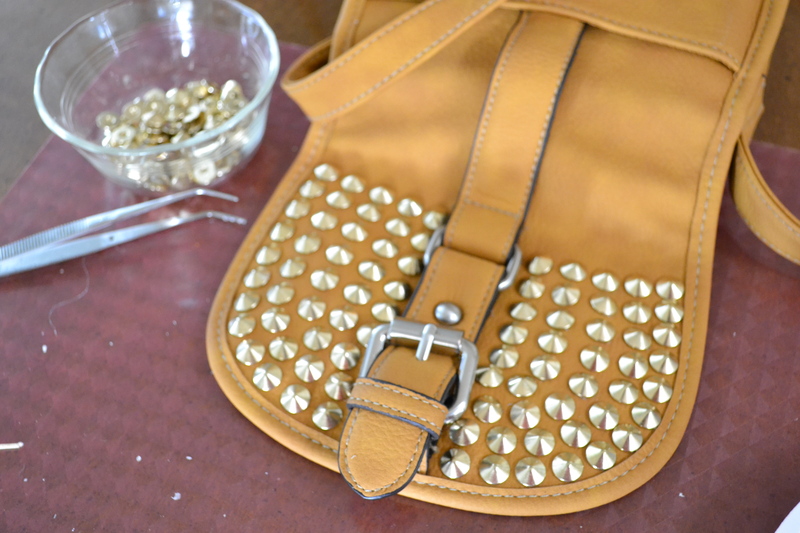 Continue glueing the studs to the bag, following the slight curve of the studs you have already placed. This time use 8 studs. Now place two vertical, straight rows of 6 studs to fill in the remainder of the blank space. It’s OK if your rows aren’t perfectly straight, you may have to move the studs around a bit depending on the spacing of the previous rows. Repeat the steps above to fill in the second half of the bag’s front flap. Ta-da! With a little patience and a keen eye, this bag will undoubtedly be the center of your next ensemble.